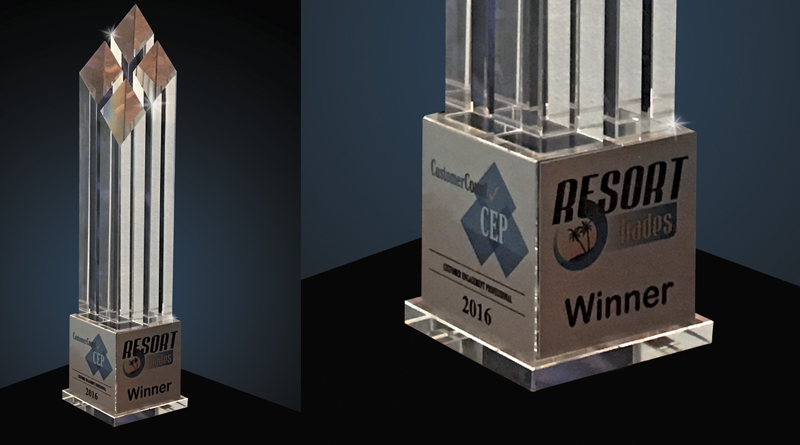 The deadline for entries into the CustomerCount® Customer Engagement Professional (CEP)/ Resort Trades Award has been extended to December 15, 2016. The award recognizes outstanding leaders who exemplify customer engagement within the resort/hospitality industry. The winning manager and their company/resort will be profiled in the February issue of Resort Trades. Two trophies will be presented; one for the company and one for the individual CEP. The criteria and rubric for the award were created by Amy Gregory, RRP, Assistant Professor/University of Central Florida. Independent judges come from the Crossville, TN area where Resort Trades is headquartered. Nominations should focus on the performance of Resort Managers, General Managers, and Assistant Managers who have contributed to the success of the company in an exceptional manner. Areas of contribution may be extraordinary interactions with members/guests; remarkable improvements in on-site ratings of the resort; innovative training techniques and outstanding social media mentions and reviews. Nominations will need to include detailed insight regarding the leader’s performance and contribution showing how the nominee’s efforts and achievements have significantly impacted the team, company, and/or community. To nominate a candidate for Customer Engagement Professional go to ccceprtaward.com. “Professional Customer Engagement individuals deserve special recognition, as do the companies which promote this unique corporate culture awareness. Both CustomerCount and our partner in this endeavor, The Resort Trades are proud to honor those who have shown exceptional performance in an area which frequently goes unrecognized,” said Kobek. The CustomerCount team introduced the award and named its first CEP winner at the 2016 PACE Convention and Expo.